Adept was approached by a prominent military contractor to develop a linear actuator. One might ask, with so many linear actuators available on the open market, how could there be a need for a custom actuator. Perhaps, there may be an actuator on the market that would meet most of the Military’s requirements, but the key word there is most, not all. 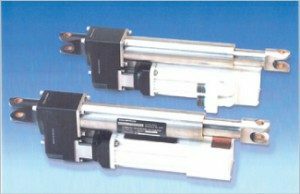 Commercially available actuators can be pretty tough, we know, we’ve designed for the commercial markets, as well. But the US military is very specific about their requirements. The design must also be qualified through an extremely strenuous testing environment. Testing that can often cost many times what it cost to Engineer and develop the actuator. So committing a commercial actuator to these test would be a hit or miss operation. Even if the custom actuator did not to pass a portion of the test, the details of the design of the tested actuator are available for modification enabling it to pass the test. Manufacturers of commercial actuators cannot modify they’re actuators without risking their commercial line. Finally, the actuator must interface within a very specific envelope, an envelope often much smaller and more demanding than a commercial actuator exist. We are limited on what we can tell you about this actuator, other than it was engineered to fit a military vehicle and its mission was to deliver the vehicles ordinance. 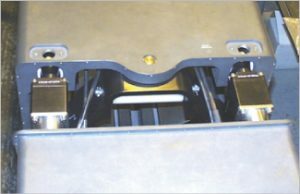 The actuator had extremely high payload capacity and had to be extremely efficient. 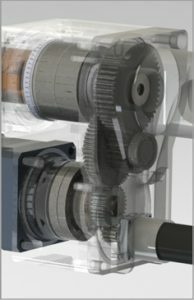 These requirements required a precise gear train, high precision bearings, tight tolerances and surface coatings only the finest products dream of! Despite the fact that this Client possessed their own in house engineering team, they chose Adept to see this project through. It’s one of our greatest pleasures to work alongside Corporate Engineering Partners, aiding them with bringing their projects to fruition. Not only did Adept provide expertise in Actuator design but they also enabled their Client to increase their bandwidth permitting them to meet the demanding schedules often required by the US Government. 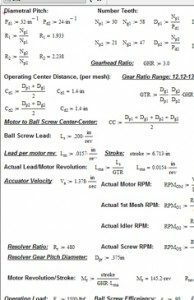 Ball screw sizing and selection. Servo Motor sizing and selection.